This is open to students who will be undertaking and or currently in a full time 1st Degree courses in the following fields, in any University in the United Kingdom, United States or Australia. Shell Malaysia prefer candidates who are pursuing Geosciences, Petroleum Engineering, Chemical Engineering, Mechanical Engineering and Civil / Structural Engineering. However, candidates pursuing other engineering or sciences or non-technical (e.g. Finance or Human Resources) disciplines are also encouraged to apply. Strong leadership skills qualities and active participation in extracurricular activities such as societies and clubs, sports, etc. Minimum 3.0 CGPA or it’s equivalent at Pre University Level. i.e. Diploma/STPM/IB, or 2As & 1B for A-Levels /Foundation. Shell Malaysia reserves the right to verify the information provided. Shell Malaysia aims to reflect the diversity of the communities it works in and will award the Shell Malaysia scholarships on this basis. 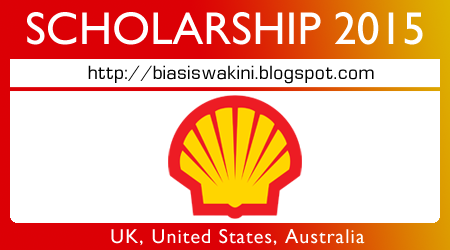 How to Apply this Shell Malaysia Scholarship 2015? 0 Komentar untuk "Shell Malaysia Scholarships 2015 - Biasiswa Shell Malaysia 2015 Luar Negara"